This new edition of In the Country brings the joys of first words and pictures to young children in a beautiful picture book with a contemporary look and feel. The book gives a close-up view of life on a farm and follows the seasons in a year. There are beautiful illustrations of children tobogganing in the snow in winter, trees and hedges alive with blossom in the spring, of swimming and fishing in the summer and harvest in autumn. Alongside the picturesare a wide range of words on all these themes relating to the countryside. From apple, squirrel and ladybird, to tractor, drill, snow, logs and farmhouse, the book abounds with delightful scenes and a variety of words from the world of nature to build vocabulary. 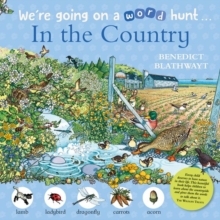 Illustrated by well-loved picture book artist Benedict Blathwayt, every topic has detailed and intricate pictures and special words and vignettes to pick out the features of each scene. The book now also includes two new fun word hunt activities that help parents and children to explore the book together, linking in with the goals of early learning through play as included in the national curriculum. It is the perfect way to share the joys of building first reading skills through a beautifuland colourful picture book.